American Airlines’ (AA) daily AA125 flight operates a non-stop service from Dallas Fort Worth (DFW) to Hong Kong (HKG). The B777 aircraft is configured with four cabin classes, offering eight seats in first, 52 in business, 30 in the added-pitch main cabin extra (not the same as premium economy) and 220 in the main cabin. Having overestimated travel time from downtown Dallas to DFW (only 25 minutes via Uber), I arrived at 8am ahead of a 1035 departure. The priority check-in desk – a separate area with around eight dedicated counters – was empty and I sailed through. Immigration and security were similarly speedy. The Admirals Club at DFW is a large, bustling lounge with plenty of seating. Located at gate D23 (just two minutes from my own gate D25) the club is accessed by an elevator to the fifth floor after passing through the ground-floor reception. This is a long lounge with one side facing onto the tarmac. To the left is a computer area, with seating and private rooms in the middle, and a bar to the right. Seats generally have good access to a US plug – remember to bring your adapter with you – and wifi is available throughout. Food options were adequate, though not diverse, while the bar is well stocked. Each visitor is given two complimentary drink vouchers. Boarding was scheduled for 0955, and an announcement in the Admirals Club at 0948 indicated the process started slightly early. Getting on to the plane was immediate and smooth. 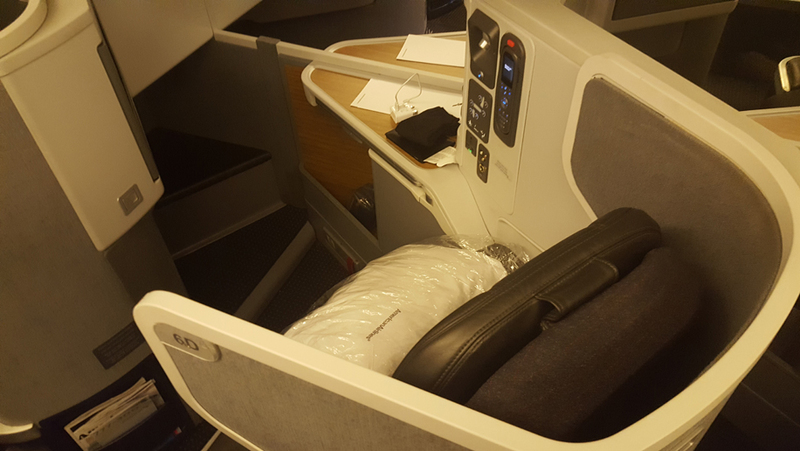 If you’ve flown on Cathay Pacific’s B777-300ER business class (Business Traveller reviewed the seat on Cathay’s London Heathrow-Hong Kong route a few months ago) you’ll find a familiar product, with the same reverse-herringbone Cirrus style of seat manufactured by Zodiac. The fully flat recline and soft “mattress protector” provides a comfortable sleep. There are useful automatic “take-off/landing” and “lie-flat” buttons, as well as options to manually customise each segment. Meal trays swivel out from the armrest and there’s plenty of room between legs and tray. The seats are kitted out with a pair of Bose noise-cancelling headphones, bedding, and an amenity kit featuring CO Bigelow products. All seats have direct aisle access while window seats enjoy slightly more privacy thanks to the angled design. My seat 6D was fairly close to the galley – I’d recommend opting for a row further back. Cabin crew came round with champagne and orange juice about ten minutes after I’d boarded, before hanging up my coat and offering a selection of newspapers. I also received stylish, black, long-sleeved pyjamas. These were comfortable and lightweight, and despite being well over six foot, I was easily able to fit into a “large”. Wifi is available on the aircraft at a charge (two hours/US$12, four hours/US$17 or entire flight/US$19). I went for the full flight option, but the speed wasn’t brilliant, with pages loading very slowly. Signing up is also quite a laborious process. 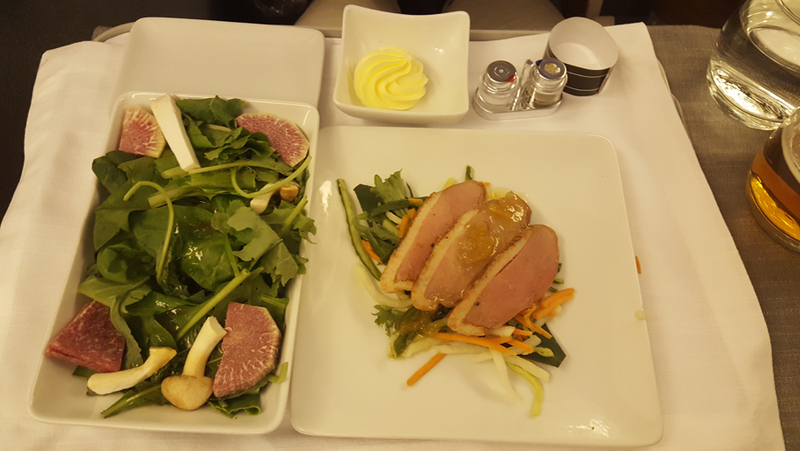 Lunch was served about an hour after take-off. The presentation was impressive and the quality of the food was high. I opted for salad with a spicy Asian vinaigrette as a starter and beef Wellington as the main, which was delicious. There are plenty of options in the IFE system, though the organisation and categorisation isn’t the most user-friendly. One thing that stood out during the flight was the service from the friendly and experienced cabin crew. Breakfast arrived an hour before we landed in Hong Kong and was pleasant. Two options were available: cooked or fruit and yoghurt. Our descent to Hong Kong began at 1450, landing 20 minutes ahead of schedule. Headphones were collected about 30 minutes before landing. This is a very comfortable long-haul offering with a spacious seat, plenty of entertainment options and high-quality amenities. A wider array of F&B options in the lounge wouldn’t hurt, and an easier sign-up process for the in-flight wifi would be helpful, but otherwise this is an attractive option for travelling between Asia and the US.